이 기사 또는 섹션은 한국어로 완전히 번역되지 않았습니다. 편집하여 도움을받을 수 있습니다. 2019-03-07 20:58:05 Margotbean에 의해 마지막으로 편집 됨.
Penny is a villager who lives in Pelican Town. She's one of the twelve characters available to marry. Her trailer is just east of the center of town, west of the river. Penny can usually be found in town reading or cleaning up at the trailer she shares with Pam. On Tuesday, Wednesday, and Friday she tutors Jas and Vincent at the museum, walking them both home afterwards. She doesn't tutor in the Summer season. Many Saturdays in Spring and Fall she'll take them to the town playground. On the 4th of Winter, she has an appointment at the clinic. When it's raining Penny can either be found inside her trailer or visiting the museum looking at the selection of books. 8:10 AM Leaves her trailer and goes outside to read near the town graveyard. 12:30 PM Returns to the trailer to wash dishes. 4:00 PM Leaves the trailer again to go outside the saloon where she sits on a bench with Maru. 6:40 PM Returns to her trailer for the evening. 9:00 AM Leaves her trailer and goes to the museum/library. Jas and Vincent join her there. 2:00 PM Leaves the library and stands near the Ice Cream Stand watching over Jas and Vincent. 4:20 PM Continues to Vincent's house and says goodbye. 5:50 PM Walks Jas the rest of the way home and says goodbye. 6:30 PM Returns to her trailer for the evening. 10:00 AM Leaves her trailer to meet up with Jas and Vincent near the town graveyard. 12:00 PM Walks Jas and Vincent to the playground north of the plaza and watches them play. 5:00 PM Walks Jas and Vincent back to town and drops them off in front of Emily and Haley's house. 8:10 AM Wakes up and walks through town to stand by the river behind JojaMart. 1:00 PM Walks back through town and sits down next to the community center. 6:00 PM Leaves town and returns to the trailer to do dishes. 8:00 PM Goes to bed in her room in the trailer for the evening. 8:00 AM Leaves her trailer and walks into town. 12:00 PM Goes up to Carpenter's Shop and sits inside. 6:00 PM Leaves Carpenter's Shop and returns to the trailer to do dishes. 9:00 PM Goes to bed in her room in the trailer for the evening. 8:00 AM Wakes up and walks through town to stand by the river behind JojaMart. 9:30 AM Watching the river behind JojaMart. 1:00 PM Walks back through town and to the community center. 2:30 PM Sitting on a bench to the right of the community center. 6:00 PM Leaves town and returns to the trailer. 7:00 PM Arrives at the trailer for the evening. 8:00 AM Wakes up for the day, leaves her trailer and goes outside near the town graveyard. 9:00 AM Reading a book under a tree near the town graveyard. 12:30 PM Returns to the trailer. 4:00 PM Leaves the trailer again to go outside the saloon where she sits on a bench. 6:30 PM Leaves town and returns to the trailer. 9:00 AM Leaves the trailer and walks to the Museum. 10:00 AM In the Museum. 2:00 PM Pelican Town, outside of the Museum near bridge. 4:00 PM Outside 2 Willow Lane, walking Vincent and Jas home. 6:30 PM Leaves Marnie's Ranch and returns to home for the evening. 8:00 PM Arrives at the trailer for the evening. 9:30 PM Watching the river behind JojaMart. 2:30 PM Sitting to right of the community center. 2:00 PM Outside of the Museum near bridge. 10:00 AM Leaves her trailer and goes outside near the town graveyard. 11:00 AM With the kids near the town graveyard. 12:00 PM Walk kids to the playground, left of the community center. 1:00 PM At the playground, play with kids. 5:00 PM Walks Jas and Vincent to Emily's house. 6:00 PM Beside Emily's house, talking with Jas and Vincent. 8:00 PM Goes to the trailer. 9:00 PM Arrives at the trailer for the evening. 8:00 AM Wakes up for the day, leaves her trailer and goes outside to read near the town graveyard. 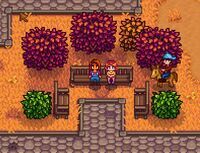 4:00 PM Leaves the trailer again to go outside The Stardrop Saloon where she sits on a bench, with Maru on Sundays and Mondays, alone on Thursdays. 7:20 PM Goes to bed. 10:00 AM In the Museum. Vincent joins her at 10:30 AM, Jas at 11:00 AM. 2:00 PM Goes outside the Museum, near the river, at the bridge. 4:20 PM Leaves for 2 Willow Lane, walking Vincent and Jas home. Pauses there. 5:40 PM Continues to Marnie's Ranch, walking Jas home for the evening. 6:30 PM Leaves Jas at Marnie's Ranch and returns to home for the evening. 8:00 PM Arrives at the trailer, then goes to bed. 10:00 AM Gets out of bed. 11:00 AM Meets Jas and Vincent at the tree where she often reads, near the town graveyard. 12:00 PM All three leave for the playground. 8:00 PM Jas and Vincent head for home, while Penny goes home to the trailer. 8:40 PM Arrives at the trailer and goes to bed. 2:30 PM At the playground with Jas and Vincent. 6:20 PM Beside Emily's house, talking with Jas and Vincent. 8:00 PM Goes to the trailer with Jas. 8:10 PM Arrives at the trailer for the evening. 9:00 AM Wakes up and moves around her trailer. 10:30 AM Leaves her trailer and walks to the community center to read. 3:00 PM Continues moving around the community center. 6:00 PM Leaves the community center and returns to the trailer to do dishes. 9:00 AM Wakes up and moves around her trailer. "I have an appointment at the clinic this afternoon." 11:30 AM Walks from her trailer to Harvey's Clinic for her annual checkup. 1:30 PM Continues getting checkup at clinic. "Hey! A little privacy, please?" 4:00 PM Leaves clinic and goes to sit in town. 7:00 PM Leaves town and returns to the trailer to do dishes. 8:00 AM Wakes up and leaves trailer. 8:50 AM Sits under tree in town, west of the graveyard. 12:30 PM Returns from town to the trailer and does some dishes. 4:00 PM Leaves trailer for town again. 4:30 PM Sits on bench south of the Saloon. 6:40 PM Returns to the trailer to go to bed in her room for the evening. 9:00 AM Wakes up and walks around her trailer. 11:00 AM Walks from the trailer out to town and sits. 4:00 PM Returns from town to the trailer and does some dishes. 6:30 PM Goes to bed in her room in the trailer for the evening. 9:00 AM Trailer is unlocked. Penny is in her bedroom. 11:00 AM Moves to the kitchen. 1:00 PM Does some dishes. 3:00 PM Sits on the couch, probably watching TV. 6:00 PM Returns to her bedroom, reading by the bookshelf. 9:00 PM Goes to bed for the evening. 8:20 AM Leaves the trailer and walks to the Museum to sit outside. "I'm going to go inside, I just wanted a quiet moment." 12:00 PM Goes inside the Museum to look at the bookshelves. 4:00 PM Leaves the Museum and returns to the trailer to watch some television. 7:00 PM Moves over to the sink in the trailer to do some dishes. 8:30 AM Leaves the farmhouse and heads to Pierre's General Store. 11:30 AM Leaves Pierre's. In town, reading. 4:00 PM Sitting in town. 6:10 PM Leaves town to return home to the farm. 8:30 AM Leaves the the farm and walks to the Museum. "Hi, honey. It's nice of you to visit me at work." 2:00 PM Leaves the Museum and walks with Vincent and Jas to town. 4:20 PM In front of Haley and Emily's house while walking Vincent and Jas home. 5:50 PM Walks Jas home to Marnie's Ranch in the woods west of town. Remains at the farm all day. Goes to bed at 10:00 PM. Penny lives with her mother Pam. She's friends with Sam. She also teaches the local children, Jas and Vincent, at the museum a few days a week and accompanies them to the playground sometimes. During the eight-heart cutscene, Vincent remarks that he once saw Sam and Penny climbing trees, at which Penny becomes visibly startled and scolds Vincent for gossiping. 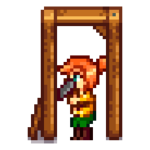 ConcernedApe has explained that he "wasn't trying to imply anything serious" with the scene regarding a continuation of Penny's interest in Sam. "[A]t 8 hearts...she's not actually interested in Sam anymore." You can give 페니 up to two gifts per week (plus one on 그녀의 생일), which will raise or lower 그녀의 너와의 우정. Gifts on 그녀의 생일 (가을 2) will have 8× effect and show a unique dialogue. Enter Pelican Town on a sunny day between 9am and 2pm. George looks into his mailbox and wonders how he'll reach a letter in the back. Penny notices and gets the letter out for him. George is upset at being seen helpless and scolds her. Penny sees you and asks if you were watching them. "I was. You did a kind thing there, Penny." (우정 +50) Penny thanks you, but is unhappy that George was upset. "You should've left him alone. Now he's grumpy." (우정 -50) Penny apologises to George. "I'm just taking a walk, minding my own business." (우정에 영향을 미치지 않습니다) Penny responds "I see". Regardless of your choice, George sighs and apologises to Penny for getting angry. He says it was very kind of her to help. Penny says she understands. After George leaves, Penny says it must be difficult growing old. "I'd rather not think about it." (우정에 영향을 미치지 않습니다) She responds, "I guess you're right... why stress out about something you can't change?" "It's just a different part of life." (우정에 영향을 미치지 않습니다) She responds, "You're right, we shouldn't ignore the reality of aging. I guess the sooner we come to terms with our mortality, the more time we can spend really living in the here-and-now." "That's why we should respect our elders." (우정에 영향을 미치지 않습니다) She responds, "That's nice of you to say... I totally agree with you. We should treat our elders with the same respect we hope to receive ourselves some day." "I'd rather die young..." (우정에 영향을 미치지 않습니다) She responds, "That's a horrible thing to say. Life is a precious thing to waste like that!" Penny bids you farewell and leaves. Enter the trailer when she's home. Penny complains about how messy the place is, and asks if you could help her clean up. As you do so, Pam returns home and yells at Penny for letting someone else clean her home. Pam eventually asks you to leave, and they continue their discussion privately. Pam admits that she's embarrassed to have strangers clean up the house. The next day, you get a letter of apology from Penny. Note that this event will not trigger if the player has purchased the Community Upgrade. Penny asks you to try a recipe she invented. "(Lie) Mmm! That was delicious!" (우정 +50) She responds: "You really mean it? Thank you! ... it's such a relief to hear that. I've been working so hard on this recipe, and I'm really proud of it. Hey, since you're the first person to try it, I'm going to name this one 'Chili de <your name>'." "Uh... can I get the rest to go?" (우정 -50) Penny is crestfallen and says her recipe was a failure. "Well it's definitely unique... how did you get it so rubbery?" (우정에 영향을 미치지 않습니다) Penny is crestfallen and says her recipe was a failure. Regardless of your choice, she invites you to watch a movie together and your energy is increased by 165. Enter Cindersap Forest between 9am and 4pm. Penny is on a field trip with Jas and Vincent. Penny asks you if you'd like to be a guest speaker and share your experience about the countryside with the children. "I'd love to!" (우정 +10) She responds, "Great! Let me just call the children over." "Sure." (우정에 영향을 미치지 않습니다) She responds, "Great! Let me just call the children over." "No... I can't stand kids." (우정 -1500) She responds, "Really?... Uh... Well, alright. I guess I'll see you later then." The scene ends. If you agree to speak to the kids, you're prompted for a number of dialogue options (which have no effect on friendship). Afterwards Penny tells the children to run along and asks you if you'd like to be a parent. "I haven't really thought about it." (우정에 영향을 미치지 않습니다) She responds, "Oh no? Well, I guess that makes sense... you're busy with other things right now." "Absolutely. I want a big family." (우정 +20) She responds, "... Me too. I'm glad you feel that way." "I guess so. It's a natural urge." (우정 +20) She responds, "Yes... the urge to care for something innocent and helpless. It makes sense that we'd feel that." "No, I don't think I'd be good at it." (우정 +10) She responds, "Oh, really? I think you'd make a good parent." "No, The world's crowded enough already." (우정 -10) She responds, "hmm... If everyone thought like that, humans would die out." "No, I don't want to be tied down with a family." (우정 -10) She responds, "Oh... That's kind of sad... but I guess I can understand your point." The scene fades and she thanks you for showing up. You receive a letter from Penny. After receiving the letter, enter the pool area of the spa between 7pm and midnight. Penny joins you in the pool. She asks if you know why she invited you here. "You have something to tell me." (우정에 영향을 미치지 않습니다) She responds, "That's right..."
"I'm not exactly sure." (우정에 영향을 미치지 않습니다) She responds, "Really? I thought you'd have noticed by now..."
"You wanted to see me in my bathing suit." (우정에 영향을 미치지 않습니다) She responds, "No!" Penny confesses her feelings for you. If the player is male, she responds, "...Oh, <your name>. I thought you did, but I wasn't sure. ...I'll always remember this night." You kiss and the scene ends. If the player is female, she responds, "...Oh, <your name>. I thought you did, but I wasn't sure. You look so beautiful tonight... I... *gasp*" You kiss and the scene ends. "Sorry, but I don't like you in that way..." (우정 -1500) She bursts into tears and the scene ends. Once married, Penny will move into the farmhouse. Like other marriage candidates, she will add her own room to the right of the bedroom. She'll also set up a small garden behind the farmhouse where she'll sometimes go to read. She will continue to work at the Museum and travel to town to work there on Tuesdays, Wednesdays, and Fridays. On rainy mornings, Penny may offer you Large Milk, Egg, Mixed Seeds, or a Geode. On mornings when Penny stays inside all day, she may offer you Omelet, Hashbrowns, or Pancakes for breakfast. On rainy nights she may offer you dinner: Salmon Dinner, Crispy Bass, Fried Eel, Carp Surprise, or Vegetable Medley. 페니 may randomly request an item at the "Help Wanted" board outside Pierre's General Store. The reward is 3x the item's base value and 150 Friendship points. Penny's look evolved over the years the game was in development. Here's a timeline showing how ConcernedApe's art and Penny's style changed over the years before the game was launched. 이 문서는 2019년 3월 7일 (목) 20:58에 마지막으로 바뀌었습니다. 내용은 별도로 명시하지 않을 경우 CC BY-NC-SA 3.0에 따라 사용할 수 있습니다.